We’re at Closerie Falaiseau. We’ve had dinner and are sitting on the sofa in front of the non-operational fireplace downstairs . Why, you may ask, are we not upstairs, drinking champagne and eating foie gras in front of our beautifully renovated Renaissance fireplace. Well, the answer is simple. We’ve lit the first fire and discovered it smokes. 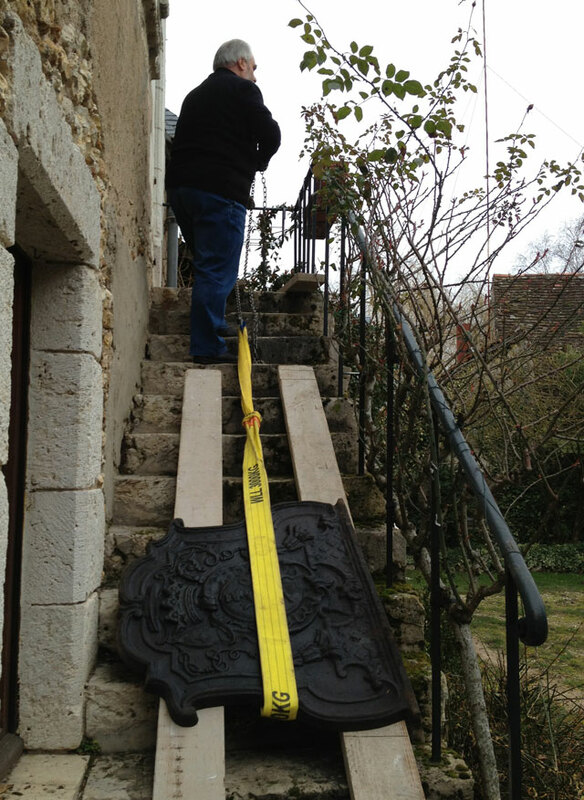 Mr and Mrs Previous Owner came over this afternoon after lunch so that Mr PO could help Jean Michel take the 150 kg fireback upstairs. It was an amazing operation and I have finally understood how a chain hoist works. 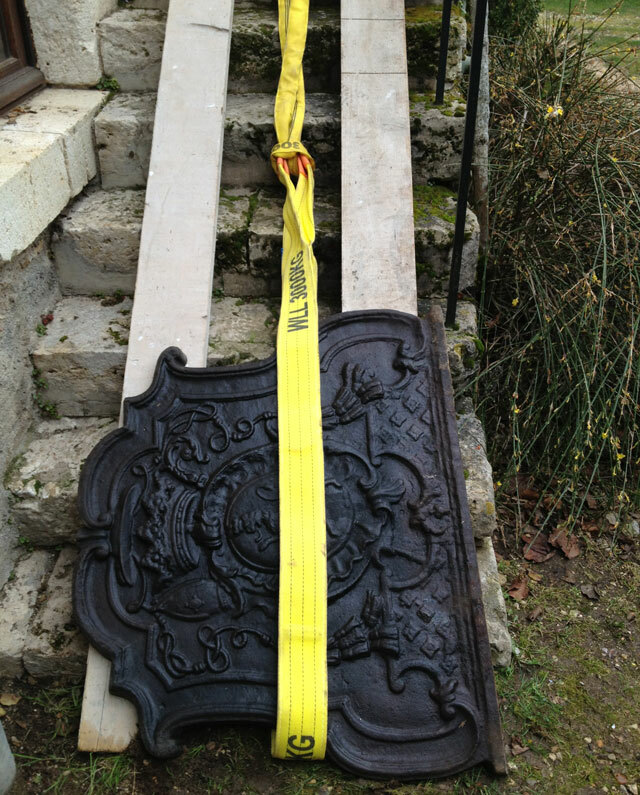 First, Jean Michel attached the chain hoist horizontally to the railing at the top of the steps (chain hoists are usually used vertically). Then he put a plank under the chain. After that, he put two thin planks on the steps. 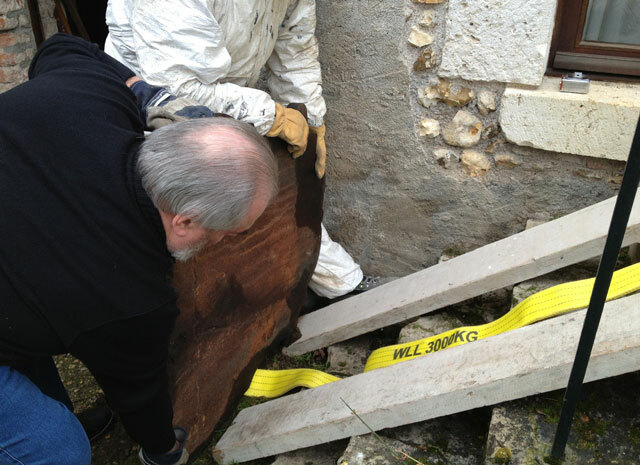 Mr PO and JM then lifted the fireback onto the first planks. JM put a super strong strap around it and attached it to the hook on the end of one of the two chain loops. Mr PO, on the landing, started pulling one side of the other chain loop. This turns a pulley mechanism inside the chain hoist housing. When the pulley turns, it lifts up the end of the other chain loop with the hook on the end. 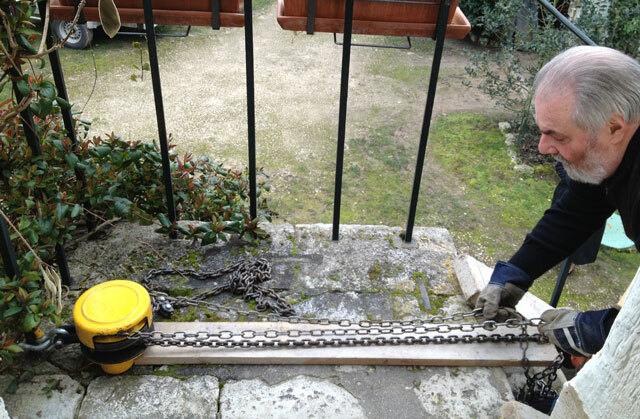 Pulling on one chain enables the hoist to increase the mechanical work that is being done. Now isn’t that clever? It was amazing to see Mr PO pulling on the chain loop while the 150 kg fireback slid effortlessly upwards. He did tell me not to stand at the bottom of the steps though, just in case the whole load crashed back downwards and crippled me forever. The planks weren’t quite long enough, so a little adjustment was needed halfway up and again when the fireback reached the top of the stairs. JM and Mr PO then had to lift it onto the landing. Using another set of planks they lifted and slid it upright into the room. I could see by this time that Mr PO needed a break so I forced JM to go downstairs and get the trolley so they wouldn’t have to lift it all the way across the living room to the fire. Just then, one of our neighbours went past on his bike so we called him up to help. That way, there were three men to carry the fireback across to the fireplace. 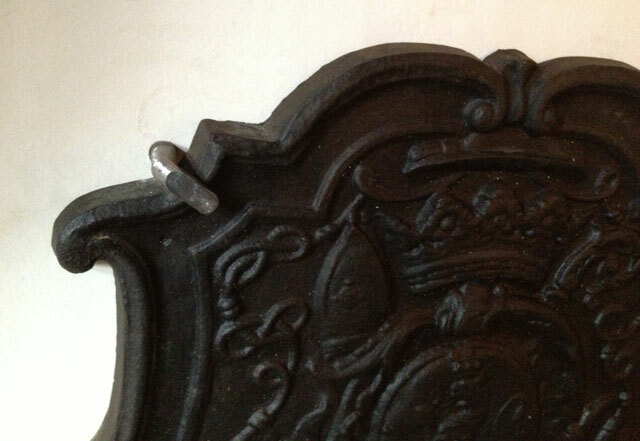 Once it was in place, JM drilled a hole in the wall and screwed in the bracket he had made previously to stop the fireback falling forwards. He then brought up some firewood from our little wood, which incidentally is now full of snow drops and budding daffodils, laid the fire and lit the first match. It was a very moving moment and we were about to cheer when we realised that the room had started to fill with smoke. We opened the door to let it out, hoping it would soon go up the chimney. But it didn’t. 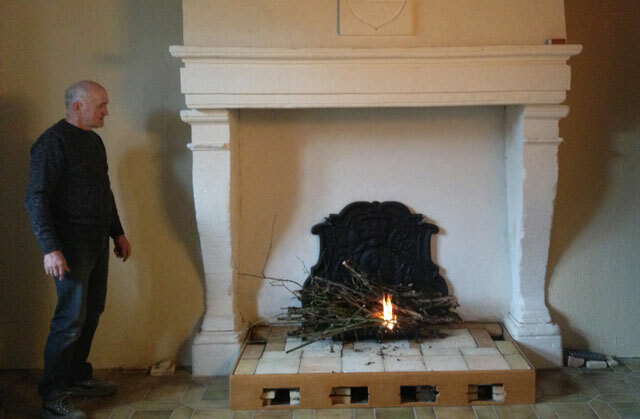 Jean Michel had suspected this might happen but thought we would just have to have a smaller fire, not no fire at all. 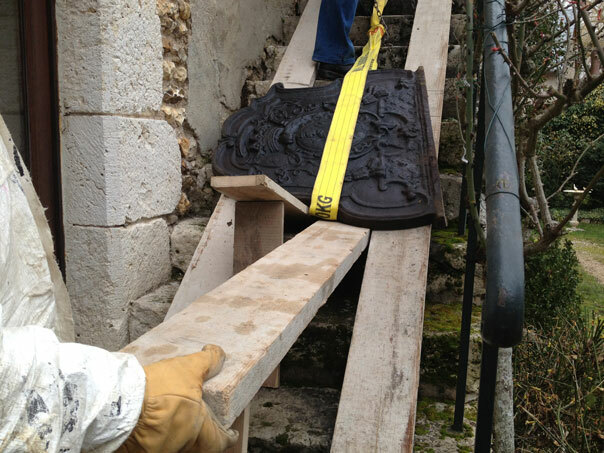 You may remember the story of the delinquent owner who removed the crest stone when he had to sell the house. Well, the exact same person bricked up the top of the chimney, reducing it by one-third (we don’t know why), thus preventing the smoke from going up the chimney properly. The next step in the operation is to have the chimney opened up again. Tomorrow, we’re phoning the roofer so he can come and give us a quote. But I think the champagne and foie gras in front of the fire might have to wait until next winter! Sigh. This entry was posted in Closerie Falaiseau, Loire Valley, Renovation and tagged fireplace renovation, Loire Valley, manual chain hoist, renaissance fireplace. Bookmark the permalink. That fireback is absolutely stunning! 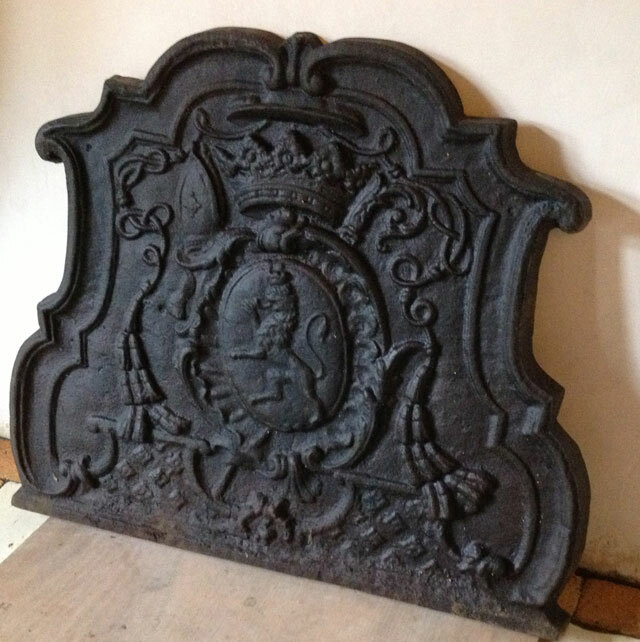 Makes you appreciate the effort to keep it and restore the whole fireplace. I’m so looking forward to seeing it when I visit – in a year when it is operational – and myself and cousin and sister intend to celebrate here in Australia when it is all done. Keep up the good work J-M and call on friends and neighbours to help. Thank you, Butcherbird. I’m hoping it will be operational next year. The roofer’s coming tomorrow to have a look and give us a quote. Gulp. The four chimneys all need chimney pots as well. BTW, crocuses or snowdrops? 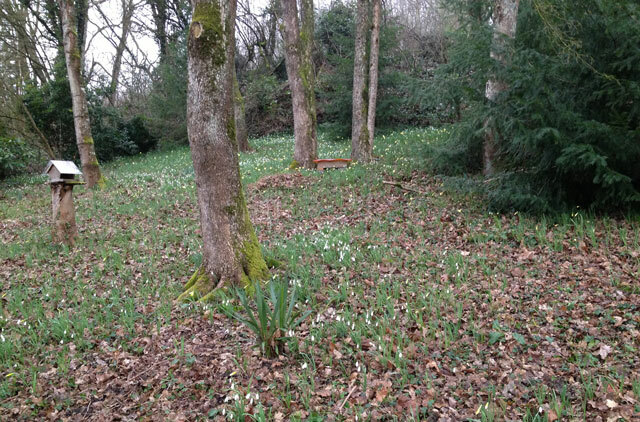 I see lots of little white flowers that look like snowdrops, but nothing in the pic that looks like crocuses? Is this where your orchids are too? They are, of course, snowdrops. I’ve corrected the post. I’ve also added a title. Our discouragement was not very inspiring last night! There are some orchids among them but the others are in the soggy ground just behind the house. When should I expect them to bloom? When the orchids flower will depend a bit on which species they turn out to be, but it will most likely be May. Thanks, Pat, for your input. In the past,fireplaces were not designed properly so nearly always smoked because of lack of ventilation so people just left doors and windows open as you have to. Today, however, windows are usually airtight. 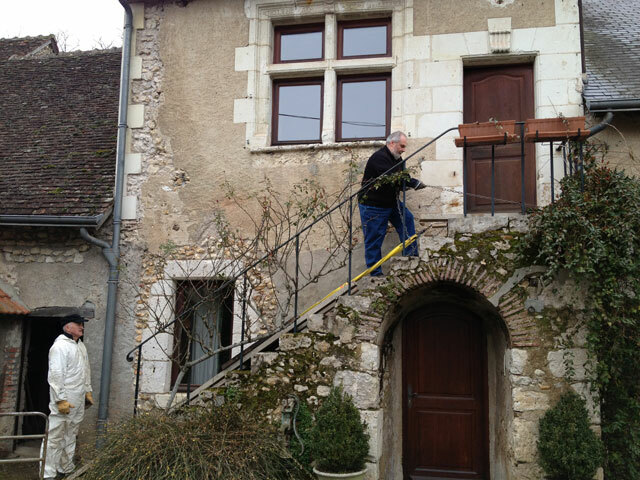 Jean Michel has been very careful to provide correct ventilation by making a large hole in the wall at the back and having the air go through ventilation channels in the hearth. 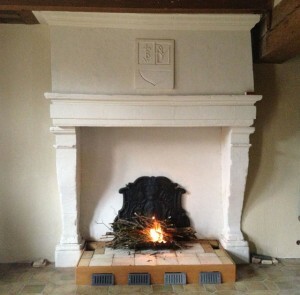 Those grilles you can see at the front of the hearth are designed for that purpose. When he cleaned the chimney, he discovered that 1/3 of the top of the fireplace has been blocked up. He was hoping that by having a small fire, it wouldn’t matter. He also used wet, green wood the first time. He’s finishing off the ventilation grilles at the moment and will then test with dry wood to see what happens. And the roofer’s coming to give his verdict tomorrow!